I waited forever, was seen by a different doctor than was advertised on this app, and was referred for an unnecessaryx-ray. It wasn't the most positive experience. I waited forever, was seen by a different doctor than was advertised on this app, and was referred for an unnecessary x-ray. It wasn't the most positive experience. Dr. Kumrah is awesome and efficient. I have been seen at his office a little over three years and its beena great experience thus far. Super informative and respectful to his patients. Dr. Kumrah is awesome and efficient. I have been seen at his office a little over three years and its been a great experience thus far. Super informative and respectful tohis patients. Dr. Praveen Kumrah DPM specializes in Foot & Ankle Surgery. House call services available to those who qualify. Dr. Kumrah attended Barry University. He is affiliated with the Montefiore Medical Center- Moses Division Hospital, New York Westchester Square Medical Center, and Saint Joseph's Medical Center. Dr. Kumrah speaks multiple languages including English, Spanish, and Hindi. Patients visiting Dr. Kumrah can receive a full range of podiatric services. Love love loved this doctor. He knows exactly what hes talking about. My visit in the room was ok, except when injection shot was being placed not enough lidocaine was given on the injection site. So I felt a lot of pain when injection was placed. Great doctor with a friendly disposition. Explained everything thoroughly so I left with no questions. I’d recommend to someone. The staff was very kind. The doctor was awesome and able to diagnose my problem right away. Highly recommended. 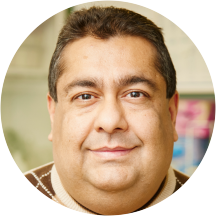 Dr Kumrah is extremely friendly and takes the time to provide me not only with great service but with good explanation of why he recommends what he does. He's very patient and has a wonderful bedside manner. He also has a very good way at explaining your case and your options. Dr Kumrah cut my toe nail too short and it bled. I'm diabetic .... I can't trust that. He will never clip my nails again. I was only with him less than 10 minutes although I waited an hour. I don't recommend. Great visit, I was very happy with him and will definitely return in the future. Overall a great visit, very informative. The only issue I am having is after my injection, I immediately felt a burning sensation and now that I am home my veins looks swollen and I slightly bruised. Dr. Kumrah saw me for an ankle injury that I had been to hospital for, but hadn't healed as fast as we'd expected. He gave me an expert wrap that let me get around much easier, and came off after justa week. He then gave me an over-the-counter brace and good instructions on how to care for the injury, which healed in exactly the amount of time he predicted it would. The front office staff was decently polite, although sometimes a bit confused. One thing to look out for is that ZocDoc does not always communicate accurately with the office - I showed up for my follow-up appointment as scheduled on this site, and the receptionist informed me that Dr. Kumrah was not at that location that day. The office staff were very good about rescheduling and got me in a day later, but it was still an inconvenience. It was great. .no words to describe it. . The doctor was excellent and very understanding. I absolutely hate needles and he took his time with the injections. The physician was remarkable. He was courteous and treated me with respect while efficiently listening and resolving the issues presented to hiim. Only downfall is that the staff did not seem to be so courteous. Regardless, I would still recommend this facility. Pleasant visit, received great treatment and advice. From the front straight to the doctor everyone was very professional and I highly recommend them to anyone and I look forward to going back. Excellent beside manner, I would visit again. None of my prerecorded registration through zocdoc was ever found. Very professional setting, the receptionists were courteous and friendly. The office is very clean and neat . I felt like Dr Kumrah really listened to my me, and you can tell he is experienced and highly skilled. give it 5 stars all the way. The doctor was professional in a very unprofessional I'm still waiting to receive results from a lab where they took toe nail clippings and told me to call back in a month. Praveen Kumrah DPM was very thorough, professional, and had a very personable attitude. I was only in the waiting room for a few minutes, but it has a nice décor and was very comfortable. The office staff helpful and very friendly.I would definitely refer this Doc to friends and family. Quick, courteous, and supportive. They really made me feel good when I couldn't feel worse. Absolutely wonderful, engaging staff and easygoing atmosphere. Dr. Kumrah was fantastic, gentle, patient, and answered all my questions. Highly recommended! My visit was excellent, staff was friendly and made my visit very pleasant will recommend to others. Love Dr. Kumrah. He really addresses all your concerns and doesn't rush you out the office. I never had to wait long to be seen which is a plus.